Premier Spey & Fly Casting and Fishing Schools for North America. Coached and Hosted Salmon, Trout & Steelhead Fishing Trips. "Beyond a seasoned fishing guide, Walt's guests are known to call him Coach due to his desire and dedication to make them all better casters and fishermen." Fly & Spey Fish the Salmon River NY. Wade, Float, Fly and Spey Fishing Lake Ontario Tributaries. Fly & Spey Fish the Deerfield River, Westfield & Swift Rivers in Massachusetts. Wade, Drift Boat, Spey and Fly Fishing The Berkshires of Western MA. Rainbow Trout, Brook Trout, Brown Trout and more. Since 1985, Walt has been promoting a more traditional style of fly fishing with catch & release for the Salmon River Region New York and the Deerfield River in Western Massachusetts making him the leader in Fly and Spey Fishing serving these rivers of the Northeast. Fly and Spey Fishing, with Hardy, Greys and Airflo Pro Staff Guide, Instructor and Coach Walt Geryk, on the Salmon River and Deerfield River. Fly fish for trout, salmon, steelhead and more on rivers and streams in New England, New York, Lake Ontario tribs and Western Massachusetts. Fly, spey, casting and fishing instruction and lessons offered while floating or wade fishing in the Northeast. 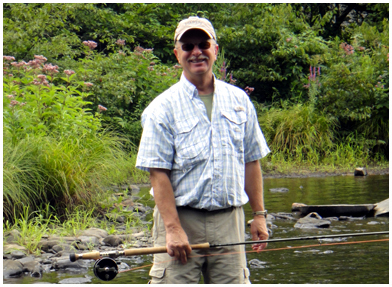 Beginners to experts are all welcomed with Hardy & Greys Endorsed Pro and fly fishing guide Walt Geryk. Learn nymph, fly, spey, streamer and wet fly fishing presentations required to take salmon, trout, steelhead and more while on your Northeast Fly Fishing Guide Trip. Leave the water a better fly fisher by day's end! © Copyright 2000-2017 by Walter Geryk and Northeast Fly Fishing Guide Service. All Rights Reserved.